I’ve been a fly fisherman for the last 15 or 20 years. When I first started trying to navigate streams and rivers with some depth and current, I learned how critical it is to have polarized sunglasses. If you can’t see the bottom, it is a lot harder to walk. Even so, I found myself slipping quite often. Many times I caught myself, but too often I would fall hard, crashing into the river, filling my waders with water. Once I slipped at the top of a waterfall, nearly broke my elbow, and watched my nice Sage rod disappear over the falls. We were at a spot I would have normally considered too deep and fast to cross, but we didn’t have a choice. 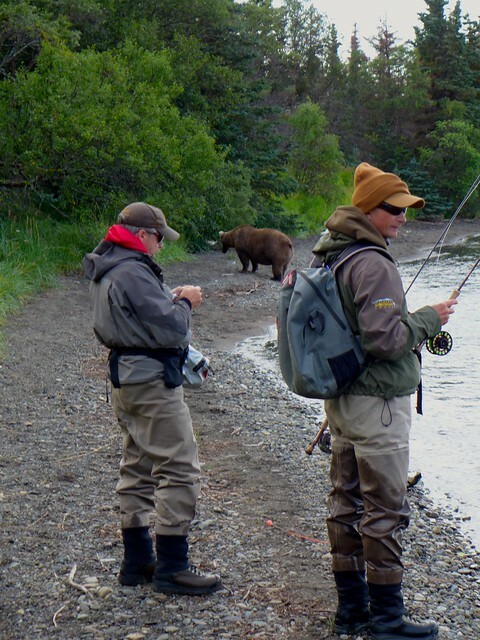 The etiquette on Brooks River is you move off when a bear wants your fishing hole. So, we took off across the river. My twenty-something guide nearly went over in the current. I kept putting my wading staff downstream and taking a step. When the current tried to push me over, I just leaned harder into my staff. With each step, I made sure one foot was secure before I moved the other one. Slowly, I made my way safely across water I could have never waded without my staff. The guide made it too, because he is familiar with the river and about a half my age, but it was a strain. Here you can see my trusty staff at my side as I pull a Rainbow out of the Kulik River. My son-in-law Kevin Byrd took this picture. See more of his pics here. I love many things about fly fishing, but two things stand out. 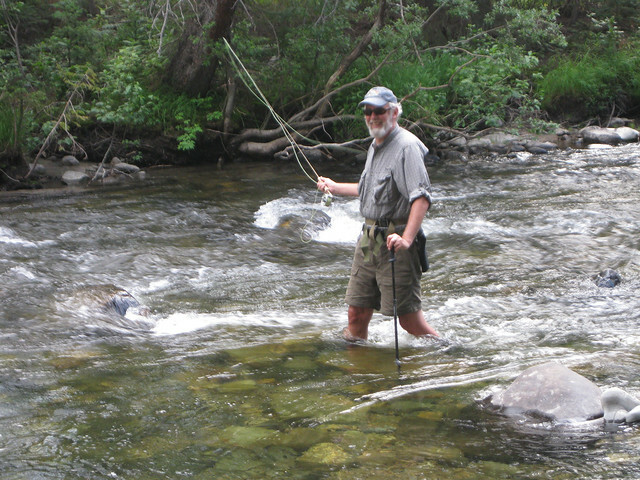 First, trout only survive in pristine streams, so when I am fly fishing, I am in a beautiful corner of God’s creation. Second, catching a fish on a fly rod requires complete concentration. If you lose concentration, a trout will take the fly and spit it out before you notice. So, fishing is a place where I am completely in the moment, not thinking about the cares of the world. God revealed himself to me in wilderness (see the post here) , and I still experience his presence most powerfully when I am in his creation. Mark asked me, “What will you lean on here, like you lean on the staff when things get turbulent in the river?” I responded, “My faith.” He asked, “What does that mean?” I said, “I will lean on the truth and stand firm.” As I continued to dwell on this image after the call, a beautiful analogy came to me. I pictured myself straining against the current, leaning heavily on my wading staff to keep from being toppled over. Then, I pictured myself leaning on God and His promises when turbulence hits in my life and work. I could see Moses leaning on his staff, and remembered the fourth verse of the 23rd Psalm: Yea, though I walk through the valley of the shadow of death, I will fear no evil; For You are with me; Your rod and Your staff, they comfort me. Finally, be strong in the Lord and in his mighty power. Put on the full armor of God, so that you can take your stand against the devil’s schemes. For our struggle is not against flesh and blood, but against the rulers, against the authorities, against the powers of this dark world and against the spiritual forces of evil in the heavenly realms. Therefore put on the full armor of God, so that when the day of evil comes, you may be able to stand your ground, and after you have done everything, to stand. Stand firm then, with the belt of truth buckled around your waist, with the breastplate of righteousness in place, and with your feet fitted with the readiness that comes from the gospel of peace. In addition to all this, take up the shield of faith, with which you can extinguish all the flaming arrows of the evil one. Take the helmet of salvation and the sword of the Spirit, which is the word of God. And pray in the Spirit on all occasions with all kinds of prayers and requests. Now I have an image to hold when things get difficult, when I’m not sure I can make it through the storm. I will see myself standing in the deep current, amongst the turbulence, leaning on my staff, which embodies these promises of God. What do you lean on when things get tough? Here is another post about leading in turbulent times: Prepare for the Journey, Storms will Come.